Choose from any House of Edgar, Bruichheath Tartan (see Tartan & Fabric), 30.5" to 36" Seat/Hip. These traditional style kilts are made to measure in any of our Bruichheath kilting tartans with a tuck-in selvedge. Kilt specification is 3 buckles and straps (1¼"), belt loops, single fringe, 2" rise, and colour matched lining. Making time is generally around 6 weeks, depending on tartan availability. Leadtime will be confirmed within two working days of placing an order or enquiry. Waist: measure firmly around waist at navel height, so that the kilt will sit comfortably without falling down. Seat: measure firmly, but not tightly, around the largest part of the seat area. 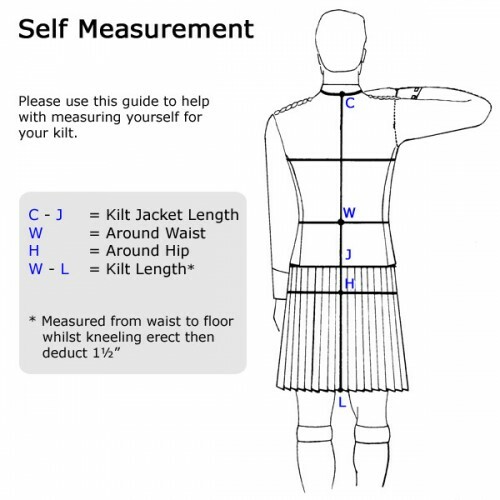 Kilt Length: measure from navel height to the top of the knee. *A standard 2" rise is added to the measured length. Height: your height. Provide this in feet and inches. If you have any queries regarding the measurement process, or would like some additional information before placing your order, please e-mail us. Please note that we cannot take responsibility for a kilt that does not fit due to incorrect measurements.